Senior Jimmy Balazy will be continuing his Academic and Wrestling Career next year at Lake Erie College. Jimmy is a Four Year Letterman and has accomplished so much in his four years at Padua. 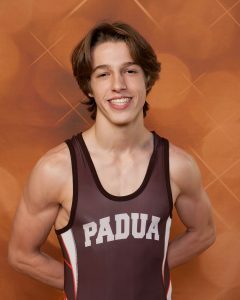 He has been 2-time State Qualifier, 2-time CIT and Sectional Champion, and NCL Champion in his four years at Padua. Jimmy will take his 130+ Career Wins to Lake Erie next year but until then he will look to go back to Columbus in March and get back on the Medal Stand.